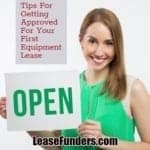 What is an Equipment Sale Leaseback? 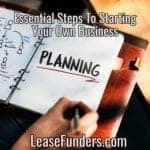 Its when you use your businesses existing equipment or real estate, that is already paid for, as collateral for a loan. You must own the equipment. 100% paid for. Or it must be almost paid for, and part of the loan proceeds will pay off the balance. 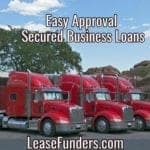 Secured business loans. Bad credit Ok. $25,000 and up! Approval within 24 hours of submission! Fast funding! Usually between 3 - 5 days! Fast approval and funding. Applications can be approved within 24 hours once everything is in order. The loan amount can be used to purchase more equipment. Or you can use it for working capital. Not dependent on business owners credit. Since the loan is 100% secured. We have been able to approve business owners with a credit score below 550! WITHOUT a co-signer! Startups can be approved. Time in business doesn’t matter. Funding can take place in 3 to 5 days. It depends mainly on how quickly we can arrange an inspection company to go to your location. Ready to apply? Visit our Equipment Sale Leaseback page to know more about how this financing option works. This sounds like exactly the thing our shop needs! We have enough business right now, but I think we might be losing some business due to the fact that we can’t offer as many services as the next guy. More equipment would be a plus. You’re absolutely right. Getting more equipment would help your business be more competitive. Don’t hesitate to get in touch with us (call 888-308-7160) so we can discuss how we can help you get the equipment you need! Well, but what if I don’t own the equipment, that is it is not completely paid for? Will I still get the loan? and would part of the loan proceeds be used to pay off the balance?